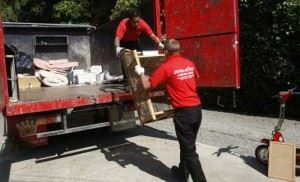 Free On Site Estimate – noun – an approximate calculation of the junk removal fee delivered after an in person assessment for no additional charge. A lot can happen between the time you call for your Junk King junk removal appointment and when the crew shows up. Usually, what will happen is that you’ll decide you’ve got a lot more to get rid of. Most folks call Junk King to get rid of a few bulky items. Then the more they think about it, the more they realize Junk King can get rid of everything that is taking up space. This includes stuff from inside and outside the house. This is why the free on site estimate is so important to Junk King. You’ll be getting a fair price and they’ll be getting a true understanding of just how much you want to throw out. When the Junk King crew arrives, you’ll take them on a tour of all the items you want removed. Hopefully, you haven’t moved anything and instead left it for Junk King to deal with. That’s what you’re hiring them for, right? After they’ve seen everything, they’ll present you with that free on site estimate. This will be a flat fee based on how much space your junk is going to occupy on the back of the truck. It’s all about volume with Junk King and not weight. That’s very important especially if you’re getting rid of things like construction waste, concrete or bricks. If the price looks good (and it will!) then the crew can start the work. Along with the labor and transportation costs, the low fee also includes all the recycling effort. Junk King might be making several additional drop offs to various recycling centers or charities. The goal is to keep as much of what they collect out of a local landfill. So far, Junk King has been maintaining a 60% diversion rate. That translates into literally tons of junk that isn’t going to waste. If you were to price out all these services on your own, you could end up spending double or triple the amount that Junk King would ever charge you. When you’re ready to toss out your junk, start with a free on site estimate provided by Junk King. It’s truly the best bet in East Houston. This entry was posted in The Junk Removal Glossary: Free On Site Estimate in East Houston and tagged Free On Site Estimate, Junk King, Junk Removal Glossary on November 27, 2014 by Jose Urdaneta. Last updated August 1, 2017 .